16112015_The_Rise_Of_Germanys_New_Right_0013: The Rise Of Germanys New Right: Made in Germany: Hermann Bredehorst - editorial and portrait photographer Berlin, Germany. 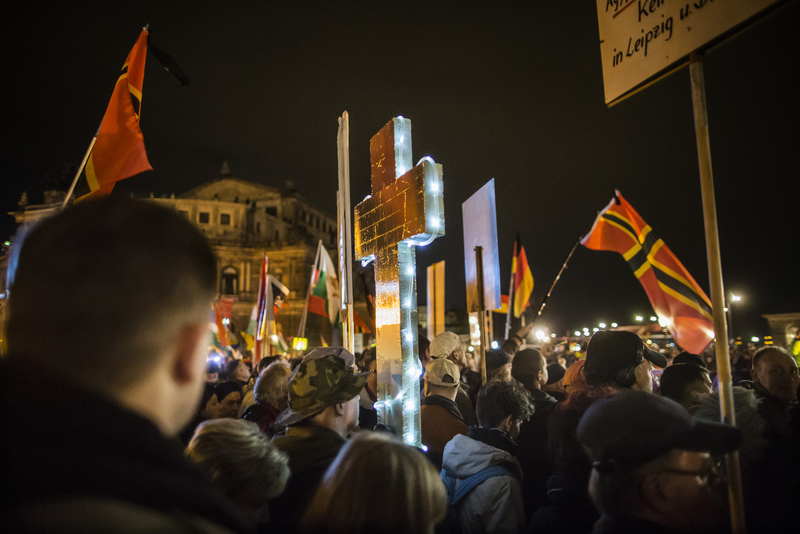 November 16,2015 - Germany, Saxony, Dresden : A demonstrator holds a illuminated cross as he takes part in the demonstration of about 10.000 Supporters of the Pegida movement at their weekly Monday gatherings. Demonstrators shout slogans as: 'Merkel muss weg (Merkel has to go). Pegida is an acronym for 'Patriotische Europaeer Gegen die Islamisierung des Abendlandes,' which translates to 'Patriotic Europeans Against the Islamification of the Occident' and has quickly gained a spreading mass appeal by demanding a more restrictive policy on Germany's acceptance of foreign refugees and asylum seekers. Parts of this right-wing movement are also against the Euro and the Western liberal style of living in general. The first Pegida march took place in Dresden in October 2014 and has since attracted thousands of participants to its weekly gatherings. But it turned out that even after the Paris attacks last Friday that left at least more 120 people dead Pegida was not able to show up in larger numbers as in the weeks before the terrorist attacks.